This was posted at £182.99 last week and has now dropped to £174.99. Should be a decent price bracket for some, but I'm holding for a price drop on the Netgear Orbi RBK50. Still good reviews on this one but less range coverage then the Orbi for a 2 pack. Just set mine up. It didn't take long and the app went through it step by step. Wot is this? How good is it. It's an easy-to-use mesh networking kit that can enhance your existing home Wi-Fi network. 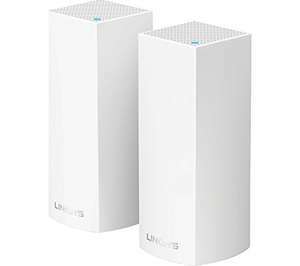 Like its rivals, the Velop uses multiple devices – rather than just a single router – which you can place in different rooms in order to establish a really strong and reliable Wi-Fi network throughout your entire home. The Velop devices are attractively designed, with each node being shaped like a little white ivory tower. The nodes are all identical, so they all have two Ethernet ports in the base that you can use for wired connections, along with the Wi-Fi features. Velop app – available for iOS and Android – forces you to provide an email address and password in order to set up an account with Linksys before you can even start to set up the Velop itself. But once that’s done, the actual set-up process is very straightforward. The app initially uses Bluetooth to connect directly to each node and configure it for you, and the app then checks to confirm that the Velop nodes have successfully connected to the Internet before you switch all your devices over to the new network. The app has the ability to prioritise up to three devices for maximum bandwidth and performance, which would be useful if you have a particular PC or tablet or laptop that needs good performance for streaming video or playing games. A powerline kit with built-in Wi-Fi is a cheaper alternative for most people, but the convenience of having a single Wi-Fi network could make the Velop (or the other mesh network systems) more attractive to you. If your home is on more than one floor, or has a tricky dead-spot, then the simple set-up process and solid performance of the Velop could be the ideal solution for improving Wi-Fi reception throughout your home. The Velop might be a case of overkill unless you have a large home that needs really extensive Wi-Fi coverage. Most of the above copy and pasted from various reviews. The above price is great as most of the reviews and other retailers have it at double the £175. If you have a very large house you may need more than the 2 routers.